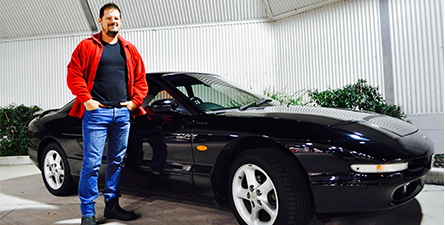 Adam: I’ve got a 1996 Ford Probe, manual V6. I bought it new; my first car. When I was living at home with my parents back in the uni days, I was able to amass a bit of cash. Then when my old set of wheels, which had been my dad’s 1981 XD Falcon, bit the dust, I was in the market for a new car. The Ford Probe came out – I saw it, I immediately thought it looked amazing. I loved the shape and the styling. It wasn’t like a pretend sports car. It had a very decent engine. Adam: I started researching them. All of them were made in Flat Rock, Michigan. I went down to the local Ford dealer, took a test drive and loved it. It was smooth, with a beautiful exhaust note. It handled really well and had great acceleration. I bought the last black one in Australia and I’ve had it ever since. Fair to say they’re pretty rare these days? Adam: You don’t see them around anymore. Ford introduced them to replace the Mustang but they stopped making them in ’97 when they realised that Americans couldn’t get past their love of V8s. I take a lot of pride in maintaining mine. It’s really been my only major purchase besides my house. It also holds a lot of memories. When I look at the car, I think of all the things I’ve done, where I’ve been with it, even taking the kids in it. It did eventually get too small for the expanding family, though, and I had to buy a minivan. Adam: Probably being in second gear. First is really torque-y, but second into third, the power is so smooth. I really enjoy the acceleration from that point. I’ve also had the engine reconditioned, so it drives like it’s brand new again. What do you listen to when you’re cruising about? Adam: Everything in the car is original, so it still has a tape deck. So I’ve still got my ‘80s and ‘90s mix tapes, which are basically the soundtrack of me growing up, stuff like Van Halen through to Rage Against the Machine and Metallica – all those really good drive tracks for when you want to put the hammer down and have some fun. But generally, when I do drive it, I don’t listen to music because I love hearing the sound of the engine. Do you and the Ford have a promising future? Adam: I’d love to keep it forever, but I’m a realist. Cars are notorious black holes that can catch you up in the passion for owning them. It’ll all depend on how far my finite budget will stretch when it comes to maintenance and repairs.